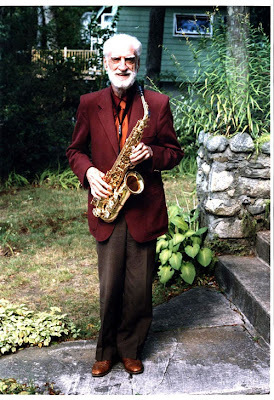 Regular reader David Wells, a smoking tenor player who teaches at the University of Maine at Augusta, sent me some overtone exercises that Dave Dempsey adapted from Joe Allard's overtone routine. You can hear Michael Brecker demonstrating some of these exercises in the Berklee master class that I posted a while back. These exercises really force you to play with no pressure, and make you deal with forward/back jaw position ("covered" and "uncovered" as Allard called it). I believe that overtone exercises are the fastest way to develop full control of your sound. They isolate jaw and upper oral tract positioning like nothing else can. They pay off by giving you a bigger sound, more control of intonation and timbre, and a more centered altissimo register. Thanks for sharing this David. I have been working on these exercises with 2:1, 3:1, and 3:2:1, but never gone beyond that. These are great!